The National Portrait Gallery, neighbour of the unrelated National gallery, is one of the most interesting places to visit in London. It was opened in 1856 and moved between various different locations, but was then moved to a permanent location of St. Martin's Place in 1896 where it is still currently situated. 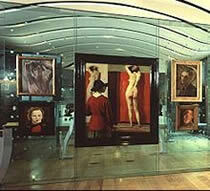 The gallery includes portraits of the Tudors, Queen Elizabeth II, Diana, Princess of Wales and Shakespeare.